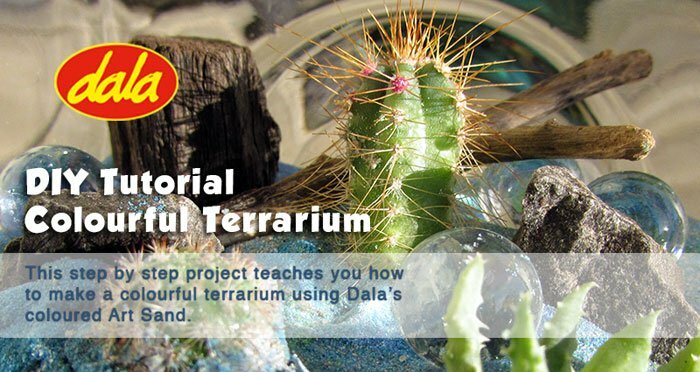 Before you start this tutorial decide if you are making a themed or colour coded terrarium. Choose colours or objects that remind you of your mom or those which will be sentimental to your mom. Is it going to be classy and sophisticated, or fun and quirky? 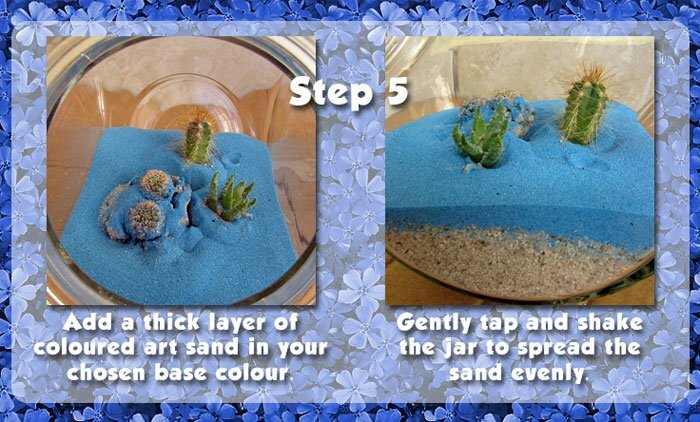 Considering this will help you decide on a colour scheme or theme and, it will also give you a better end result and gift that you will be excited to give her. 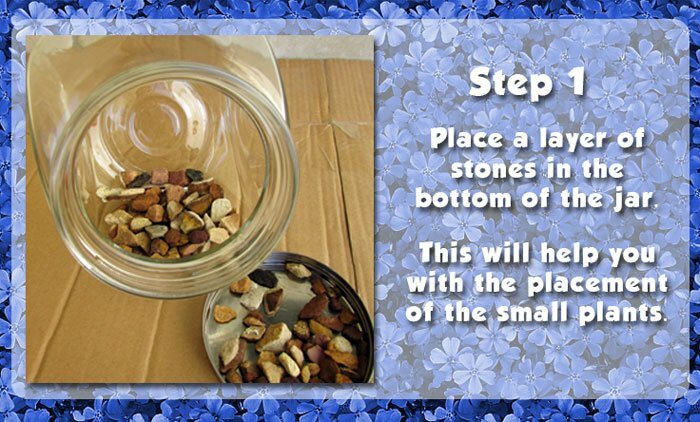 Place a layer of stones at the bottom of the jar. 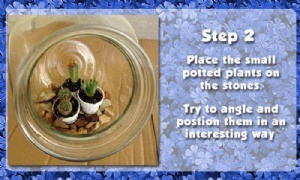 This will help you when placing the small potted plants. 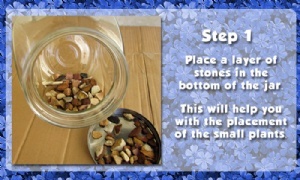 Place the small potted plants, in their pots, at different angles on the stones so that they are in an interesting layout. 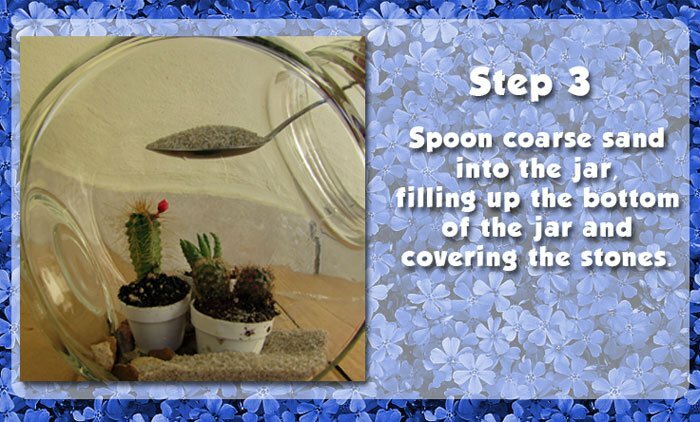 Spoon the coarse sand into the bottom of the jar until the majority of the small pots are covered and only their tops are uncovered. 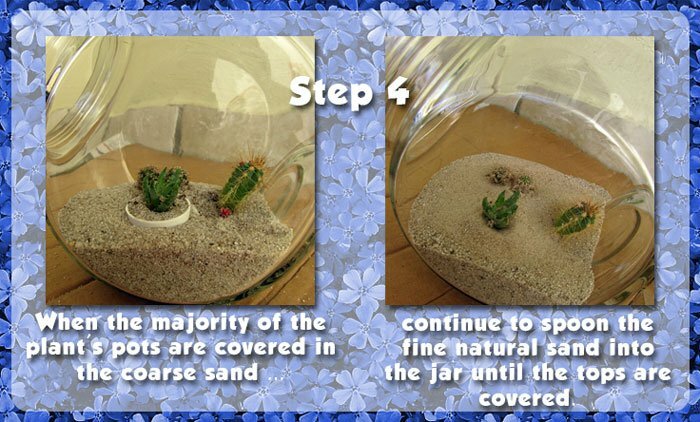 When the potted plants are mostly submerged in the coarse sand, continue to spoon the finer natural sand into the jar and cover the tops of the plant pots. If you need to adjust the placement of the plants you can do so using the stick or pencil. Choose a base colour and pour in the entire bottle (or two depending on your terrarium size) as evenly as you can, or gently shake to spread the sand evenly over the natural coloured sand. In this tutorial we used a base colour of blue. 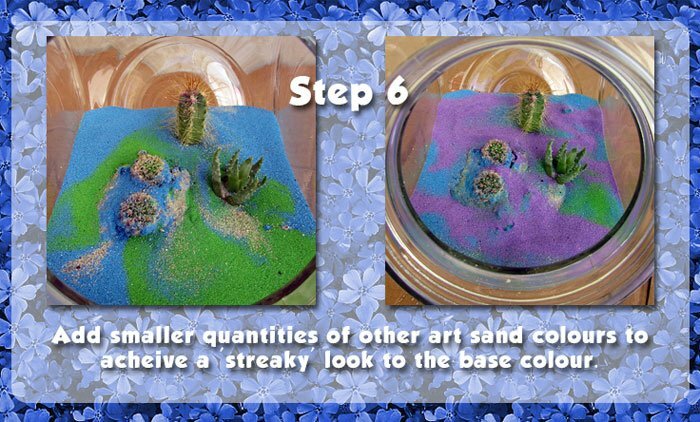 Pour smaller quantities of other art sand colours over your base colour and gently shake the jar to achieve a marbled / streaky look to the sand. 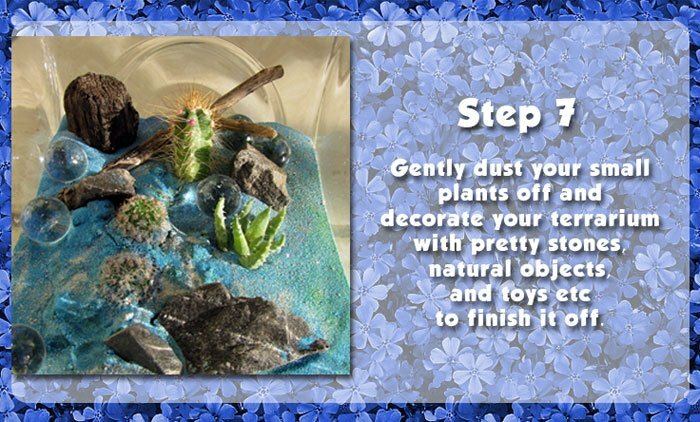 Finish your terrarium off by gently dusting any sand off of the potted plants with the paintbrush and also adding additional objects (like those suggested earlier in the list of things you will need) for decoration. 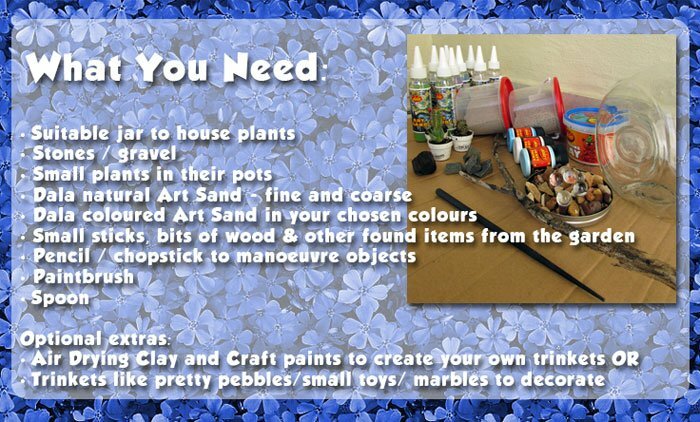 If you don't have small trinkets you can use Dalas air drying clay to create some and Dalas craft paint to paint them. 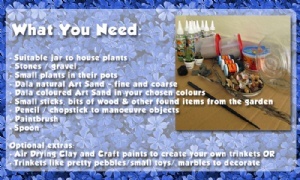 Some suggested objects to create from the air drying clay : animals, mushrooms, small houses, monsters or small people. 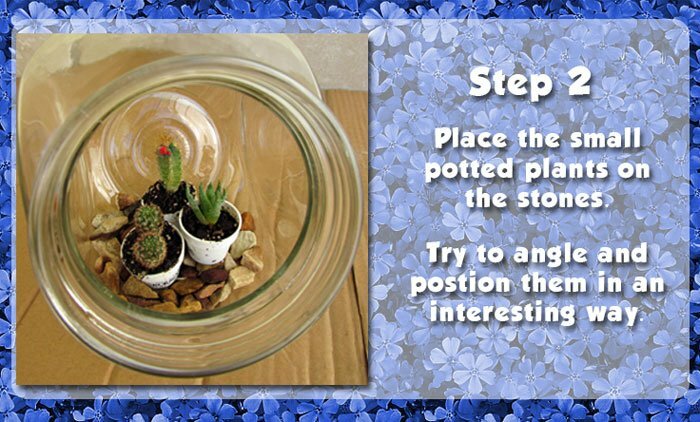 Be creative and plan a tiny scene! 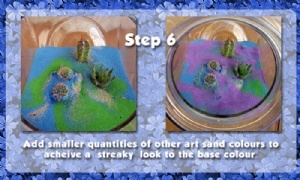 Cacti don't need much watering, use a spray bottle and give them a spray once a week. Leafy plants may require a small watering from time to time. This item has 1082 views.